Been waiting forever it seems for this line to become available. Love it!! Oh, I love that fabric line!! I have bought 5 FQs of it already and have decided I need some yardage too. 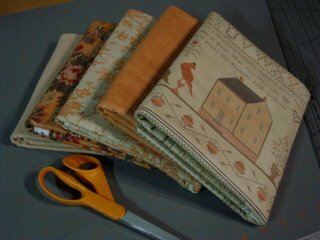 Also I have posted a photo of a tablemat my long-armer made on my blog from 5" squares of this line. I bought it Saturday! What are you going to make with it--inquiring minds need to know! I hadn't seen this line...yet another thing to add to the shopping list for my trip to the states next month! Oh yum! Wish I could get it but I'm being good. I'm settling for 4 of the 5" charm packs. Oooh, those are pretty. Where did you order them from? I might just have to get some for myself for Christmas! And well done on the weight loss!